Is Kevin Ware’s time at Louisville finally over? year after his gruesome leg injury in the NCAA tournament, Kevin Ware is transferring from Louisville. 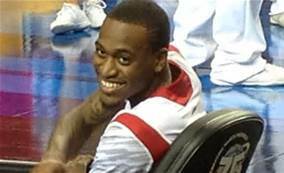 Ware became Louisville’s rallying point on the way to the national title after he broke his leg in a win over Duke in the finals of the Midwest Regional last season. He had a rod inserted in the leg and tried to come back this season. But he averaged 1.7 points over nine games and eventually took a medical redshirt. He wasn’t seen with the team over the past several weeks. On Saturday, the day after Louisville’s season ended with a loss to Kentucky, the junior from the Atlanta area announced his decision. ”We wish Kevin Godspeed,” coach Rick Pitino said. We hate to see you go, but we wish you the best!